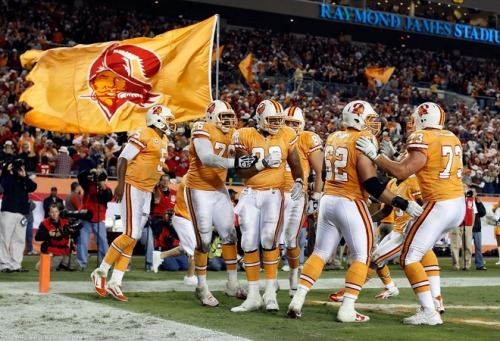 The 2013 season for the Tampa Bay Bucs was a forgettable one to say the least. The Bucs finished dead last in the NFC South with a record of 4-12 and were near the bottom in major statistical categories including total yards, passing yards, and total points scored. Needless to say, this lead to second year head coach Greg Schiano and General Manager, Mark Dominik to be fired in attempt to reboot and get back to championship form where they were in 2002. It looks as if the reboot is going beyond player and coach personnel, as current Bucs defensive tackle Gerald McCoy, and Hall of Famer, Warren Sapp took to twitter to break the news. According to McCoy and Sapp, the Tampa Bay Buccaneers will unveil the new version of the Bucs helmet and logo on the NFL Network this Thursday night at 8PM. A possible reason for the change could be the new NFL helmet rule which was enforced on the Bucs this year, which would not allow them to wear their retro "Bucco Bruce" helmet, because a team must wear the same helmet for the entirety of the season.The current helmet and uniform look is currently one of the best and most unique in the NFL, but guess the Bucs heirachy felt a change throughout was needed. One feature that Sapp hinted at about the helmet was the possible inclusion of a chrome grill, which sounds awesome in theory, but will most certainly need to be approved by Roger Goodell, and his cast of NFL minions. Our one request....bring back the creamsicle.